So it’s a double-sided PCB with a GPIO connector tracked to various pads round the outside of the board with space to solder in headers or screw-terminals (or both! ), as well as having space in the middle to solder components to, supporting a standard DIL type layout, SOIC chip mounting pads and an open area. Power supply. Powering the Pi off batteries, I needed a regulator to feed a stable 5V supply into the Pi. 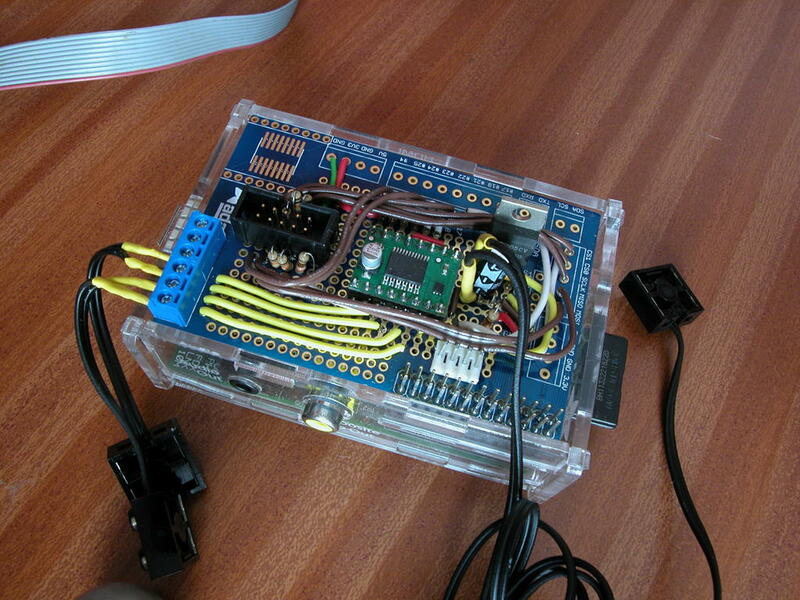 A motor controller. Essentially a dual H-bridge controller of some sort. Interface from a wheel position sensor of some sort. 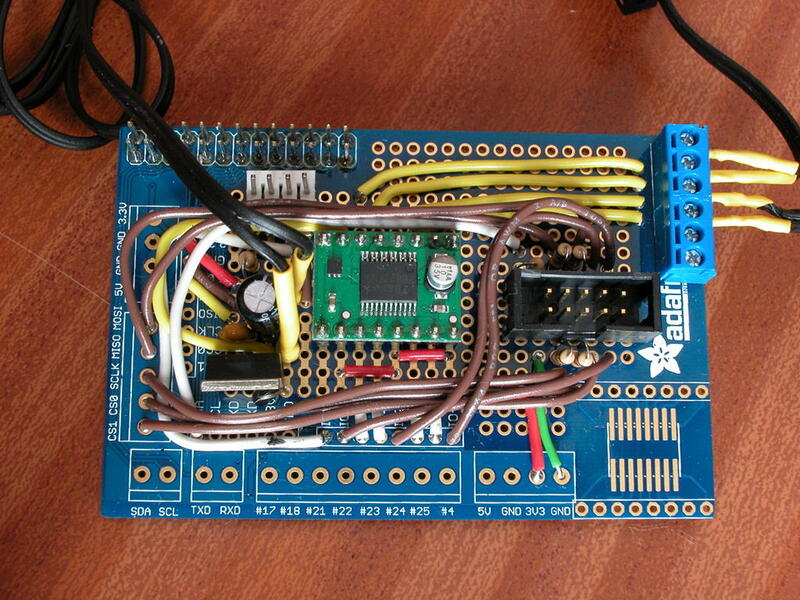 As I was running out of time to produce a prototype, I used a handy 7805 type regulator. This is great, but not too efficient – ie. it gets a bit hot when fed from 9v. The keypad was originally going to be the Big Traks own keypad, but I substituted one I’d made earlier (some 25 years ago!) 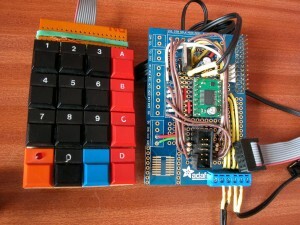 – it’s a simple 4×4 matrix and you can see 4 resistors on the protoboard. There is a 5th next to them which acts as a limiter for the LED that’s on one of the switches. The wheel rotation sensor is the board to the left – it’s nothing more than an infra-red LED pointing to an IR photo diode. With a suitable current limiting resistor on the LED, the photo diode can be connected directly to one of the Pi’s GPIO inputs. I also used to to test the motor driver too. I was a very easy way to do some “rapid prototyping” before committing to solder! However, overall, the board was very easy to work with – and does look a lot more professional than just hacking together some stripboard, and combine the board with the Adafruit case as I’ve done here, and it does open up many more possibilities for Pi interfacing projects. 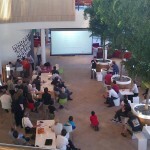 Just a quick post and a few photos from last nights RaspberryJam in Bristol – held in the most excellent Bristol and Bath Science Park. 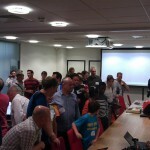 Alan (@teknoteacher) the driving force behind the RaspberryJams, was on-form as usual, keeping everything flowing nicely with his usual jokes, and while I didn’t count the people, there seemed to be well over 100 attending! 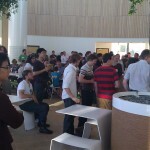 There was a nice time to do some networking before the main event (spread the jam as Alan says! ), then the talks then a big break-out session afterwards with people showing off what they’re doing with their Pi’s and so on. However after that delay, as Keith often ends his talk with BBC BASIC running under RiscOS on the Pi, I cut my talk a little short and spoke more about my BASIC than what I’d fully planned to speak about – however the essence of what I was going to saw was that programming (or Software engineering!) isn’t just about glitzy/glamorous web “apps” with shiny graphics and fancy buttons… Programming also encompasses a lot more – which some people think is boring, but others (like me) find much more exciting – and that’s the world of computer control. So, someone, somewhere has to write the code that drives the braking system on your car, the engine management and so on. Someone has to write the low-level software for your hand held GPS, your microwave, your washing machine, etc. Someone (or probably some team!) 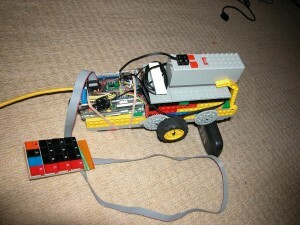 wrote the software for the Mars Curiosity robot – now there’s a project you can’t afford to get wrong! And if you’re wondering who wrote the software for some of these things, and thinking it’s some underpaid chap in India or China, then think again – Heber who hosted the RaspberryJam last night is based in the UK, manufacture their own control boards (in the UK!) and write software for things as diverse as vending machines to the Dyson Washing machine! I’ve decided to start to use the GIT Source Code Management system… So hoe better to learn about it than to jump in at the deep end and actually use it for a project… So to that end, I’ve moved wiringPi to it and setup some simple hosting for it – mostly for my own convenience, but also to allow others who’re using GIT to quickly obtain updated versions and so on. I’ll eventually be putting links from the main downloads site I’m using to the GIT repository, but until then, a quick look and it can be found here. One of the issues on the Raspberry Pi is that I’m now seeing a lot of people coming to it from a traditional microcontroller background and trying to use the same ides on the Pi as they use on the microcontrollers – and promptly falling into a trap, or getting wildly unexpected results. So… Linux provides a standard set of system calls – the issue is that you have the overhead of calling them – and that overhead can be quite variable, it depends on the system call and what it needs to do. The standard delay call, nanosleep(2) will sleep for at least how long you tell it, plus any operating system overhead and that comes to at least 20 to sometimes over 100 microseconds. So.. when we need accurate short delays in the order of microseconds, it’s not always the best way, so to combat this, after studying the BCM2835 ARM Peripherals manual and chatting to others, I’ve come up with a hybrid solution for wiringPi. What I do now is for delays of under 100μS I use the hardware timer (which appears to be otherwise unused), and poll it in a busy-loop, but for delays of 100μS or more, then I resort to the standard nanosleep(2) call. I’m using the count-down timer and polling for the IRQ event (it doesn’t generate an IRQ, we’re just polling for the completion event here) This avoids any issues with having to take into account counters that wrap over. This isn’t perfect though, and it can still take longer than we want it to, but for small delays it should be a lot closer to what we want than just calling the standard nanosleep(2) routine. This will be in the next version of wiringPi which I’ll publish in a day or 2. I recenty ran a 2-day course for someone who was keen to learn more about Linux, C and the Raspberry Pi. Teaching isn’t new to me, I’ve run courses on my telephone systems, various aspects of Internet operations for people like web design companies and even used to teach something called Engineering Computing during my years at Napier, so to run a 2-day course in my office wasn’t hard and turned out to be a very rewarding experience for both myself and my student! So what did we do? Started with getting more to grips with the Linux command-line, the use of pipes and redirection. Demonstrating that programmers are lazy (ie. command and filename completion!) We then went on to look at C programming. My student had been doing some C already, but wanted to learn a bit more. Variable scope – the difference between local and global variables. Static variables and so on. We moved on to separate compilation and linking files together – how we can use header (.h) files to give the compiler “hints” about how to call a function in another file. We also moved on to some of the wiringPi functions too. Talked about concurrent programming and had a brief introduction to threads (with the simplified thread library inside wiringPi). Hot on the heels of the PiFace, to add to my collection of Raspberry Pi interface boards comes the Mini PiIO Protoboard from DTRONIXS. Top photo is the base board sitting on a Raspberry Pi, the 2nd one is the board made up with a minature version of my Ladder game. It came as a kit of parts, PCB, GPIO connector, the 2 long edge connectors, a short 5-pin connector and some surface mount components to make up an independent 3.3v regulator fed off the Pi’s 3.3v supply. Assembly was strightforward, although I did solder on the additional 5-pin connector, then realised nothing actually connects to it, and it stops the little breadboard from fitting, so had to unsolder and remove it. The long pins down each side carry almost identical signals… Starting at the end furthest away from the GPIO connector, there is 5v, 0v, GPIO pins 17, 18, 21, 22, 23, 24, 25 and 4, then 0v and 3.3v. After that the 2 sides are different – the side nearest the edge (SD card) carrys the serial and I2C port pins and the opposite side carries the 5 SPI interface pins. One thing I really like about the board is that the GPIO pins are actually labelled 0 through 7 – and they correspond directly with the wiringPi pin numbering scheme! The 3v connections can be jumpered to come from the on-board regulator or the Pi’s own 3.3v supply. 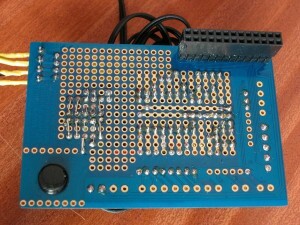 And a little note about putting the breadboard on – it comes with a sticky-back, but if you are careful, then you can align the holes in the bradboard with the edge connectors, then it’s possible to plug in some DIL chips directly into the GPIO pins which may save a little bit of wiring. As a quick experiment, I assembled a miniature version of my ladder gameusing a 10-segment LED bargraph display chip and assembly was quick and straight forward – the original used 12 LEDS but I only had 10 LEDs in a convenient package, so had to modify the program a little. 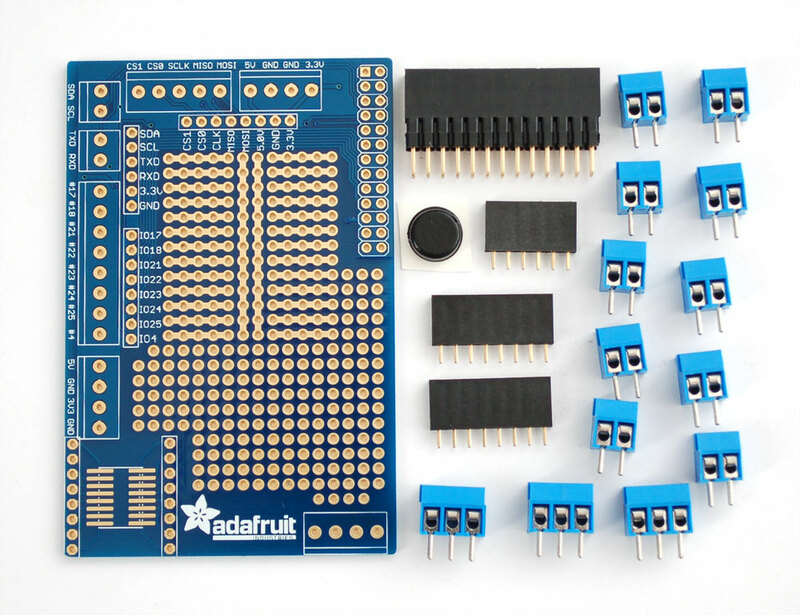 So if your after something to help you quickly get a few LEDs and switches going, or to experiment with a single DIL chip interface, then this little board is certainly one to look out for! It makes the main 8 GPIO signals easily avalable on both sides of the board with power and ground on both sides too which can make wiring signals to either side relatively easy. The separate 3.3v regulator can be used to take some of the load off the Pi’s 3.3v supply – probably essential if driving something that’s going to take more than a few 10’s of mA. Other than putting some sort of isolation between it and the Pi, the only minor issue I have with it is that like the PiFace board, it won’t fit into the SKPang cases I’m using although I’m pretty sure I could modify the pillars on the SKPang cases to take one, other than that it’ll very probably be the first protoboard I’ll reach for when trying out something small. 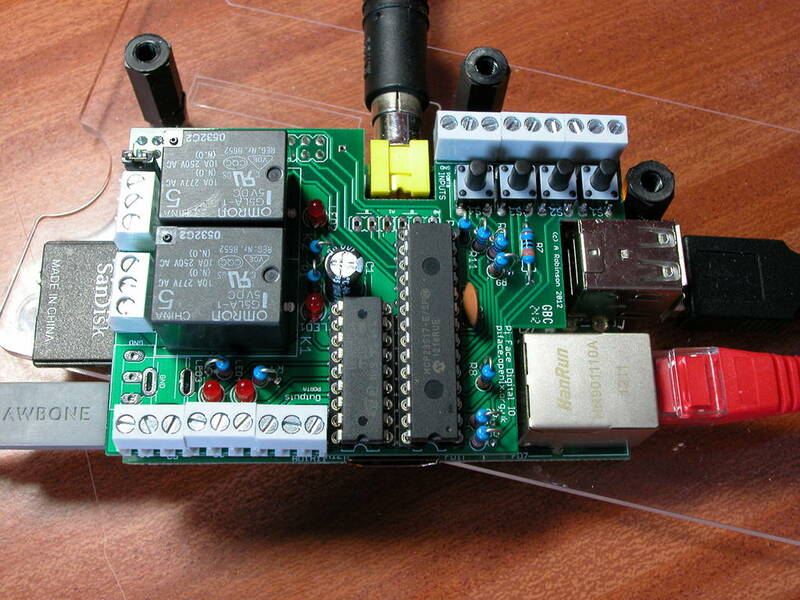 PiFace is a peripheral IO device for the Raspberry Pi. It was announced at the recent Cambridge Raspberry Jam event so I bought one for the princely sum of £30. It’s designed to fit on-top of the Pi and has an identical footprint with cut-outs to accommodate the Composite video, Ethernet and USB ports. It takes 3.3v and (optionally) 5v from the Pi itself, although there is provision for a separate supply to power the output relays and buffers. While the driver chips will support up to 20V, the relays are designed to only run at 5V, so the external supply needs to be 5v. My board was not fitted with this socket. 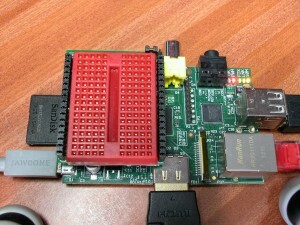 These photos show the PiFace fitted to a Raspberry Pi. The 9 screw terminals at the bottom/front of the photos are the output pins (Power is the pin on the left), the 2 sets of 3-way screw terminals are the relay outputs and the set of 9 at the top/back are the inputs with 0v being the one on the left, closest to the composite video output. The PiFace leaves all ports accessible on the Raspberry Pi itself, with the obvious exception of the GPIO port. 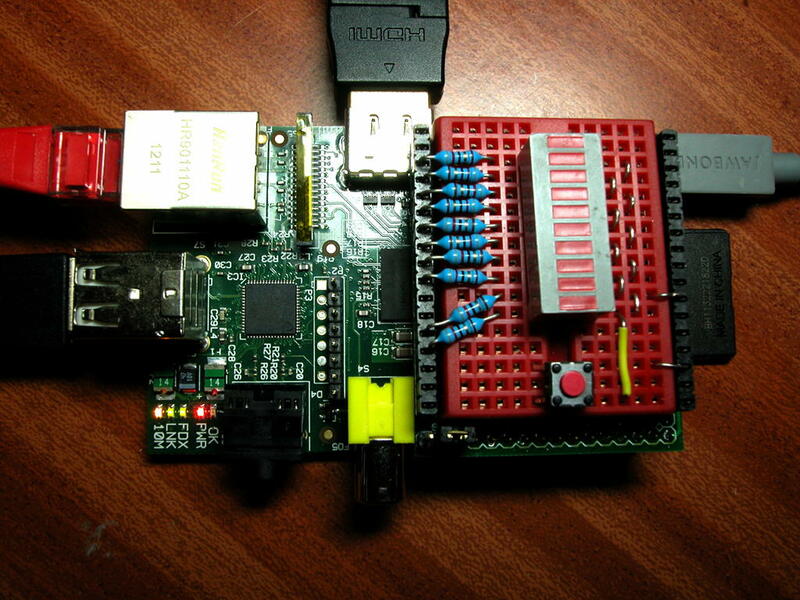 It uses power and the SPI bus on the GPIO only. It does not make the other GPIO pins available for use. 2 of the outputs are connected to relays which are capable of switching 10amps and 230volts… That’s a 2Kw load however I would not personally like to try to switch anything close to that with those little screw terminals. 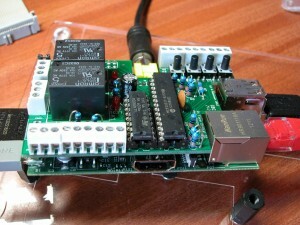 The PiFace itself is supported only by the large capacitor on the Raspberry Pi board as well as the GPIO connector. If you were to exert a little too much force on the PiFace, it’s possible you may damage the capacitor and also short circuit some of the PiFace’s pins on the HDMI connector. One of those sticky felt pads on the PiFace at the location of the HDMI connector is helpful. It’s probably not recommended anyway, but do not try to fit the PiFace to your Raspberry Pi when the Pi is turned on – they do it in one of the videos but it caused my Pi to reboot – presumably due to a power spike going through the board. PiFace gives you 8 buffered input pins (with 4 switches on-board connected to 4 of these pins), and 8 buffered output connections. 2 of the output connections are connected to mechanical relays. You can use the 2 buffered outputs in parallel with the relays, but they will obviously click on/off when you use them. The relay outputs have an LED wired in parallel with the relays and there are 2 other LEDs on the output pins, so with the 4 buttons and 4 LEDs (with the relays clicking away), it’s possible to do some very simple experiments right away. The GPIO is handled by an MCP23S17 SPI/GPIO interface chip. 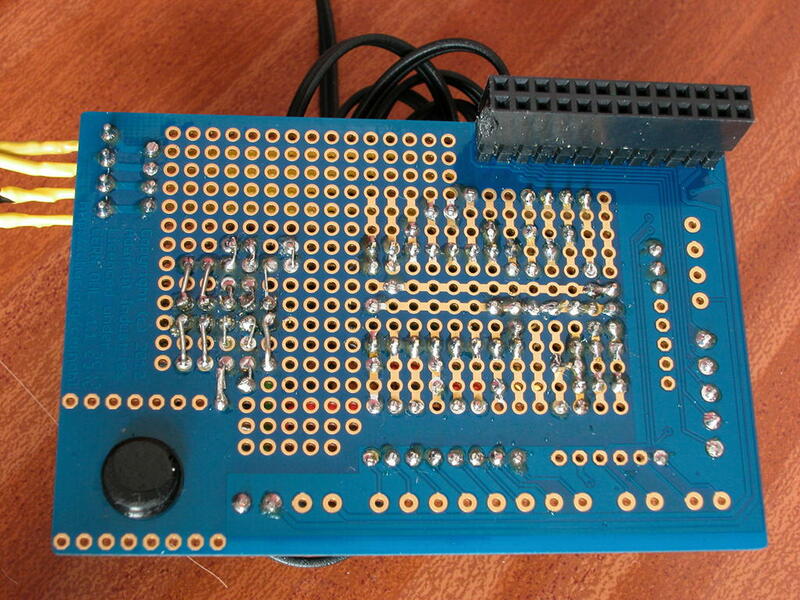 This provides 16 general purpose IO pins with the PiFace dividing them into 8 inputs and 8 outputs. The Input pins have a 330Ω series resistor and the MCP23S17 is capable of applying internal pull-up resistors making it easy to detect signals that pull to ground such as simple switches without any additional components. NOTE: Like the GPIO on the Raspberry Pi, the MCP23S17 is a 3.3v chip. Do not attempt to connect it to systems generating more than 3.3v outputs. The outputs are driven via a standard ULN2803A darlington driver chip. There is no support for the interrupt capability of the MCP23S17 although this could be achieved by soldering a wire from its interrupt output pins to 2 of the Raspberry Pi’s GPIO pins. At least none that I could find, other than references to a new SPI driver for the kernel, and as I’m using one of Chris Boot’s kernels with his SPI driver installed, (which I think is now back-ported to the official kernel released by the foundation), so I didn’t think there was much point pursuing that line of attack… So armed with the circuit diagram, the MCP23S17 data sheet and some time, I wrote a version of wiringPi to work with the PiFace board. 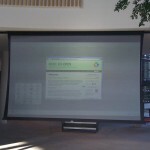 Details here including a software library and demonstration program. It’s a nice little board. Relatively easy to use, but with no software supplied, could be quite daunting to use! Hopefully someone will produce and publish a Python, scratch, etc. libraries to enable it to be used easily, but until then, there’s wiringPiFace. I feel that the inputs could have been handled better – especially for something intended for classroom use – with e.g. opto-isolators to allow for a range of input voltages from 3 to 12v for example. That would make it much more robust and versatile in a classroom environment… Probably add to the cost, and possibly board size too though, so I can see where a compromise may have been made, however the MCP23S17 is socketed and replacements cost under £1 in the UK. Also, the circuit diagram shows 2 jumpers that are not fitted to my board – they are attached to the chips address-select lines. The manual for the MCP23S17 says that these pins must be strapped either way, even if they are not being used, so I soldered on some 0.1″ headers and put on a couple of jumpers. 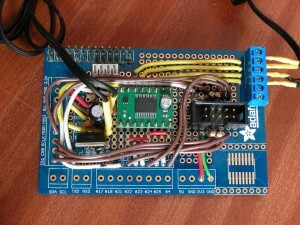 I’m hoping this is just an oversight on my early production board… It’s also hard-wired to the Raspberry Pi’s first SPI chip select output – again, a jumper would have been nice, but given that you can’t connect anything else to the Pi when this is connected it’s probably a moot point. The mounting is a little flimsy, I’d like to see a proper spacer pillar in the underside of the board, just to stop it wobbling, although even a sticky-backed felt pad over the HDMI port would be a good start. One of the things that struck me was a comment from Eben that he had a box of 200 Raspberry Pis (for sale) and he noted how easy it was to carry it and made a comment about the potential computing power. This was 1993/1994 or thereabouts. Still – it’s somewhat interesting to think that Eben can carry a box of 200 Pi’s representing something that 20 years ago was simply incomprehensible to think about at the time. There are many strategies for driving 7-segment displays – I’ve chosen to use one of the lower-level ones, doing more in software than in hardware to keep the hardware design simple – so as you can see here, it’s almost as simple as it can get. We have 8 GPIO outputs going to the 8 segments of the display (white + yellow wires) and 4 GPIO outputs going to the individual digits common line. 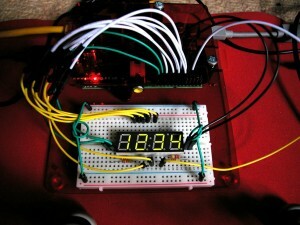 (the black and green wires) This is a common anode display, so the anodes of each of the 8 LEDs in a digit are connected together. 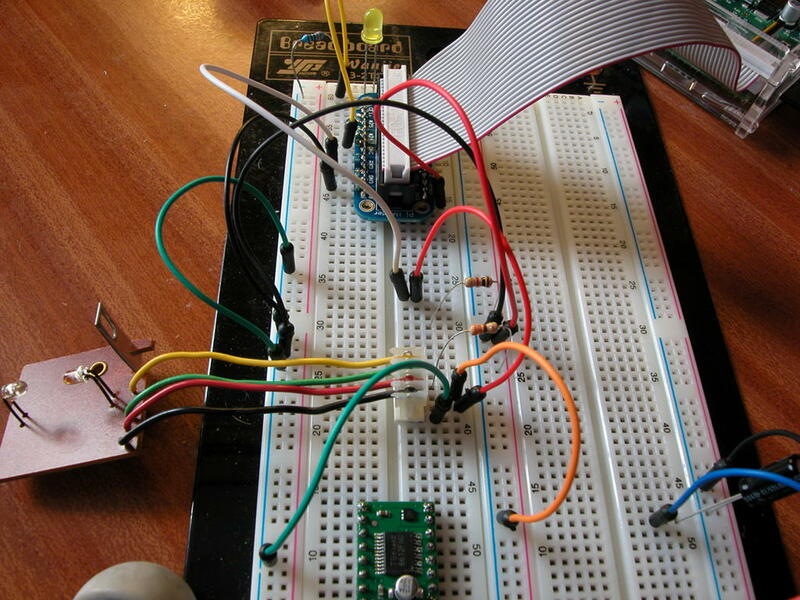 To drive the display, we start by setting all GPIO pins to outputs, set the 4 digit GPIO pins to logic zero and the 8 segment GPIO pins to logic 0. Now we need to light up the display one segment at a time…We do this by selecting the digit and driving it’s common connection to logic 1 (this is the common anode), then drive the segments one at a time to logic 0 to illuminate them, pause for a brief period of time (I’m using 500 μS here), then turn it off by setting it to logic 1 and moving on to the next segment. 4 digits, 8 segments per digit, 500 μS per segment means that the total scan time will be 16mS, or just over 60 times a second. That ought to be fast enough to eliminate flicker. So, we illuminate each segment of each digit in-turn and if we do it fast enough then our persistence of vision will fool us into thinking they’re all turned on all the time. 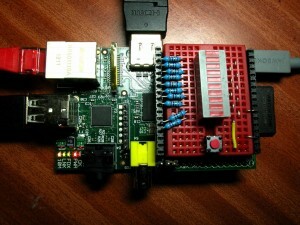 This is when we really need a real-time operating system, and while there are some patches to the Linux kernel, they’re not standard in the Pi kernels, and even if they were, they still might not be suitable for use here – to do it “properly” really does require very tight control over the hardware, interrupts, peripherals and so on, and I am not convinced that Linux will give us all that control. However, there are some simple things we can do to improve things – to the point of making a task like this relatively easy and do-able. This first thing we can do is tell Linux that we want to have a higher scheduling priority and that we want to be considered for real-time scheduling too. We used the sched_setscheduler() system call to effect this. It’s not perfect – a higher priority process can interrupt your program (and if you want to maintain things like keyboard entry and allowing other programs to run, then you must allow this!) but it’s a good way to give your program a good boost. The other thing we can do is to use Posix Threads and run what’s effectively a 2nd program concurrently with your main program, and have that 2nd program (although it’s actually a function inside your main program rather than a 2nd program) manage the LED updates. As long as the LED display routine calls delay() every now and then, then the rest of the system will carry on which the display is kept updating. (It can use other methods to de-schedule itself, but calling a wait function is easiest – I actually call delayMicroseconds() in the display code). All that remains is to establish a way to communicate between our main program and the display routine and I use a simple global variable here: A string array which I can write to in the main program and read from in the display routine – we don’t need any fancy locking, etc. for something as simple as this. Even after that, setting the real-time priorities and running the separate display thread, I still see the occasional flicker or glitch on the display. It’s probably no real issue for a display, but imagine if we were driving a stepper motor… One reason I still maintain that Linux is really not the right tool to do that form of “hard” real-time control, but for LED displays? it’s OK.
Any down-sides? Well the overhead of keeping the display updated is between 15 and 20% of the CPU usage on my Pi! So it has to be said that the Raspberry Pi really isn’t the right device to be driving such a display, but it’s good to know that if we had to then we can. And I’m sure some of the tricks in my program will be useful in other applications. You can find the software here. All the details over on the wiringPi pages here.